The General Management group within an organization play an important part in the implementation of the organization’s strategy. 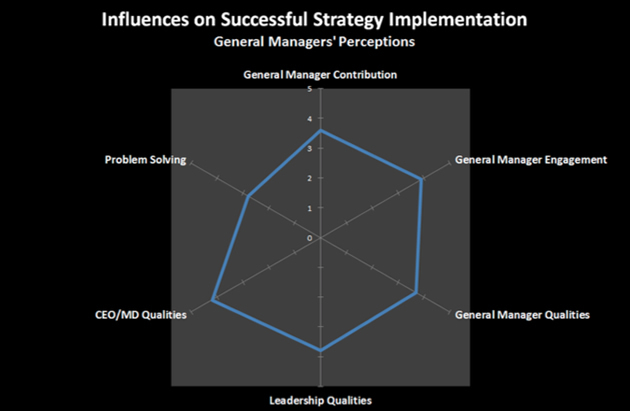 The perceptions of General Managers regarding their level of input into the strategy formulation process, as well as the perceived quality of the leadership of the organization, can have a significant impact on how well a strategy is likely to be implemented; which is why it is important to take the views of General Managers across the organization into account in determining what could potentially work or not work. Problem Solving – the ability of General Managers to handle issues that could obstruct effective strategy implementation. Managers/Directors the next level down. Operate effectively within the organization’s environment. In the example below, the qualities of the CEO/MD and organization’s leadership are rated quite highly, as are the qualities of the General Managers and their contribution towards strategy development and their capacity to engage. However, the ability of the General Management group to identify and address current issues/problems score low which could potentially have a negative impact on effective strategy execution. If you would like to find out more about how this tool can be used to help your organisation, please contact us.